Using a hearing aid seems like an intuitive process, but it can be difficult to get used to them in your ears. 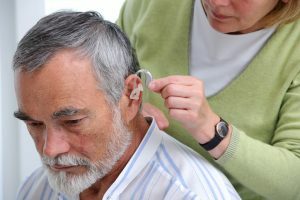 Using a hearing aid seems like an intuitive process, but it can be difficult to get used to them in your ears. The first days and weeks after you use your hearing aid are critical to ensuring a comfortable fit for the years to come. Here is some of our best advice for getting used to your new hearing aids. First, don’t get discouraged right away if your hearing aids are uncomfortable or feel a little bit funny at first. Think of a hearing aid like wearing glasses on your face for the first time. You can feel the glasses resting there, and it takes a little bit of getting used to. However, your discomfort will go away after a few days and things will feel as good as new. After a few days with your new hearing aids, you will be used to the feeling. If you do love your new hearing aids, it’s tempting to leave them in all day long. However, it’s totally fine to only wear your hearing aids when you are comfortable doing so for the first week or so. Eventually, you should be used to wearing your hearing aids for all of your waking hours. You will get used to filtering out noises and adjusting your hearing aids in uncomfortable situations and not be dealing with as much discomfort. However, you will never get used to it if you never wear them or wear them all the time at first and stop because you are uncomfortable. When you first get your hearing aids, start out using them in quiet areas. You should always sit in a quiet room in the home and practice hearing soft sounds, like a watch ticking or a horn beeping outside. Many times, those noises will seem very loud because you haven’t heard them in that manner in so long. While your brain gets adjusted to the volume, you should wear them in quiet areas to get used to noise. Never wear your hearing aids in a noisy place or crowded area if you just got them. This entry was posted on Friday, December 8th, 2017 at 5:40 pm. Both comments and pings are currently closed.